U.S. auto sales totaled 959,049 units in September. But what that means is hard to quantify because in September 2009 dealers were singing the post-clunker blues. The fat government incentives had dried up -- and so had vehicle stocks. • On a percentage basis, the 28.5 percent year-over-year gain is the biggest since October 2001, when General Motors' massive post 9-11 Keep America Rolling incentives sparked a 29.2 percent gain. • September's seasonally adjusted annual selling rate of 12.2 million, as calculated by Automotive News, is the highest since the clunkers-fed August 2009 SAAR of 13.7 million. • September's total is down only 6,208 units, or 1 percent, from September 2008, when Lehman Brother's collapse turned a financial market decline into a rout. • But perhaps the most interesting comparison is this: Auto sales of 3,006,803 in this year's third quarter are 505 units, or two-hundredths of a percent, higher than last year's third quarter that contained the entire clunkers program. A year ago, July, August and September sales totaled 3,006,298. The first two months were spurred by clunkers, which ran from July 24 to Aug. 24 with government incentives on almost 700,000 vehicles. But with depleted dealer stocks, September sales sagged. This year, without $3 billion in government incentives and less factory cash, automakers beat that. Chrysler Group's 61 percent gain led all players in September. Most automakers boosted volume by double digits compared with September 2009. Chrysler sold 100,077 cars and light trucks last month, pushing it past American Honda Motor Co. for the No. 4 sales position. Honda finished the month with 97,361 sales. But Honda still handily leads Chrysler so far this year, 912,436 to 820,220. Last month's only loser: Suzuki, down 12 percent. It's off 49 percent in the first nine months. Among the major players, the four automakers that have outperformed the market's 10 percent growth so far this year had the best September percentage gains, all up more than a third. 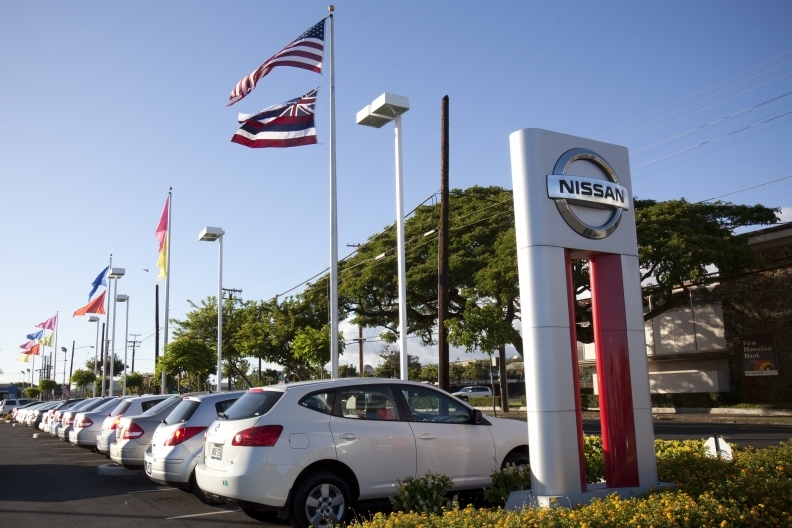 Chrysler, Hyundai-Kia Automotive, Ford Motor Co. and Nissan North America all fattened their year-to-date numbers with September increases ranging from 34 percent to 61 percent. All four have boosted sales through nine months at least 15 percent. But while American Honda, Toyota Motor Sales U.S.A. and General Motors Co. posted double-digit September increases, their below-market, nine-month gains are stuck in single digits. Toyota's 17 percent September advance at least moved its year-to-date results into positive territory, up 1 percent to 1.3 million. Honda rose 26 percent last month, and 3 percent for the year so far. GM gained 11 percent in September and is 6 percent higher on the year. Light trucks are making a comeback against passenger cars. Automakers sold 467,937 pickups, vans, SUVs and crossovers in September, capturing 48.8 percent of the U.S. market. Cars fell to a 51.2 percent share. Just last September, cars accounted to four of every nine vehicles sold, a 55.6-44.4 split. All truck segments outpaced the overall market's 29 percent growth last month but vans, up 53 percent, and pickups, up 41 percent, are the hottest. The rising market carried most car segments, although none matched the market's performance, and sporty cars were off 3 percent.